Since 2010, the farmers at Hunter Hill CSA have grown a variety of vegetables, fruits, and herbs on 2 acres of our family farm in Forks, PA. We care deeply about no-till, regenerative agriculture that enriches the soil, traps more carbon dioxide, and makes heaps of nutritious, chemical-free produce. Our CSA members value the freshness and quality of our produce, as well as the fact that we farm using organic practices. They love the ease of picking up from a farm so close to home, and creating meals centered on farm fresh produce. Do you want to eat more veggies, eat locally, eat seasonally, and support local agriculture? Becoming a CSA member helps you do it all. Dan sure loves his veggies and fruits! Born and raised in the Lehigh Valley, he’s been involved in small scale farming for over a decade. Dan worked at Liberty Gardens in Coopersburg and at Lehigh County’s farmer apprentice program The Seed Farm before moving onto family land in Forks Township in 2010. That year he started the CSA with 13 members and worked on less than an acre. 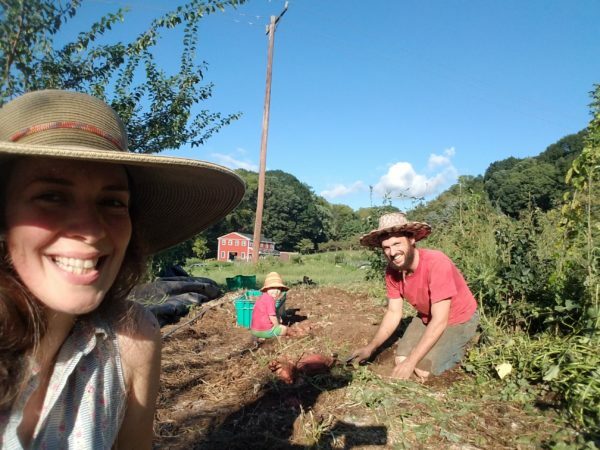 Katy has been working on the farm with Dan since 2015, when she moved across the country from Portland, Oregon so they could get married, start a family, and grow the CSA. Back in Portland, Katy was a member of an urban farming collective where she learned the basics of growing food and spent free time gleaning neighborhood fruit trees. A former florist, Katy’s love of flowers has followed her to the farm, where she plans to grow more and more flowers each season. When not farming, Dan, Katy, and their kid Yona enjoy hanging out with friends, singing and making music, walking in the woods, and cooking yummy food out of the plants they grow.